Movavi picture editor is available in English and Russian. The photo editor supports most of the file formats that you would want to use daily. Some of them include JPEG, PNG, BMP, TIFF, PCX, GIF, PPM, PBM, XBM, PTX, XWD and more supported formats. The requirement list for the software is not very huge. You just need enough free space for the installation of the software and to carry out operations using them. You must have compatible versions of operating system and that is all that is needed. The product is not very expensive and has not been highly priced. Though not free of cost, yet it can be afforded by most. Often there is a situation and picture when there are certain elements you do not want. Movavi photo editor provides you with just what is needed. In just a click you can eliminate and remove things and elements that you do not want. Photo bombers, unwanted shadows or power line shall no longer be a problem that spoils your picture perfect memory. Most of the software are very complicated and you do not understand how to carry out the process, however with this easy to use editor application you can easily get perfect shots and images without having to do any fussy and complicated manipulations. Open the image that you need to an element from. Select the area or portion that you wish to remove and click start erasing. The task is done and now just save the finished image. Movavi can do much more than just removing elements. There are other options to enhance the picture or image quality. 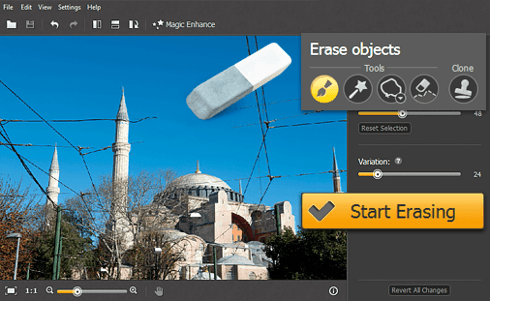 Magic Enhance has options of adjusting and fixing the level of brightness, contrast, sharpness and the white balance of the image. You can also rotate, trim, crop and flip the image. This will help you ensure the best frame and quality for the picture. You can also adjust the size of the picture before saving it so that it can be shared online and does not take up much space on your hard disk drive. When you are using the software by Movavi you can be completely assured that you are one of the best quality applications for editing. Their goal is to provide the maximum level of customer satisfaction and to keep up their good and honest work. You exactly get what you pay for there are no fake promises.